Sprinkle salt and 1 tbsp lemon juice on the poha and mix well with a spoon/spatula. Heat oil in a Kadai or Pan, crackle the mustard and cumin seeds. Add Urad dal, Chana Dal, Cashews, Curry leaves and stir fry for a minute. Add raisins and stir fro few secs, add onion, green chilly and ginger. Stir fry for till onion turns translucent. Add the poha and stir fry for 2-3 mins till onion-potato masala and poha is well incorporated. Drizzle 1tbsp of lemon juice on top and stir to mix. Garnish with Coriander leaves and serve hot. 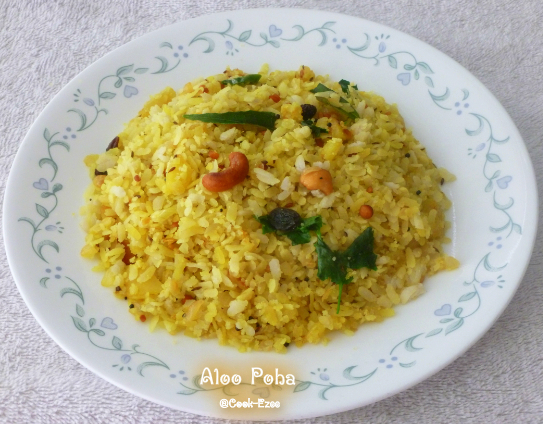 1) You can make it without potato as well ie just with onion and is called Kandhe poha/Onion Poha. 2) You can add a chopped tomato and opt out potato as well for a tangy poha recipe(and I love tomato/tamatar Poha). 3) While seasoning add little asafoetida for a nice aroma, I didn't add it since I ran out of it.